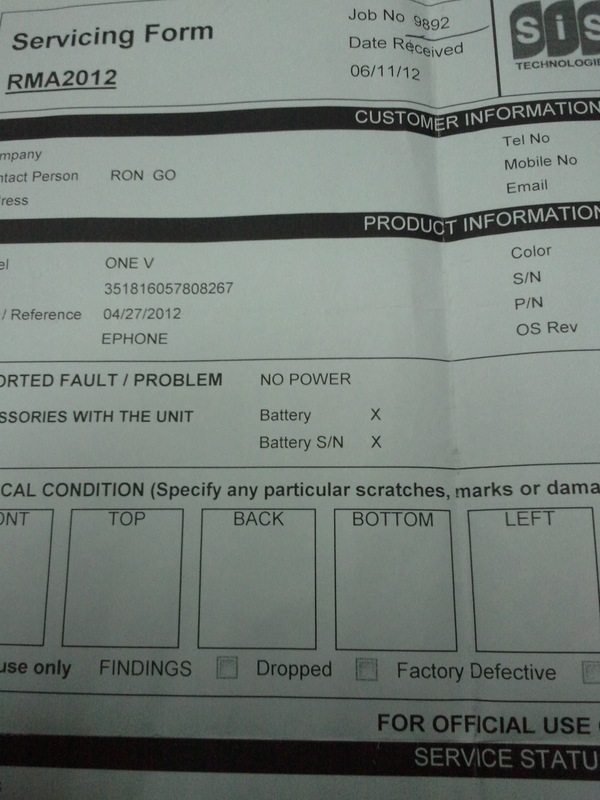 HTC One V: One Very bad experience Part III | The Misadventures of Roni G! Just when I thought that all my troubles about my HTC One V are over, my phone died again. It died on me just 26 days after it was "fixed" by the service center. I didn't have the time to visit the "service" center so I asked someone to drop off my phone for me. This time I wasn't issued a service phone which infuriated me since I have to look for another phone while they try to revive my dead phone. Instead of enjoying the low price of the HTC One V, I actually spent more, transportation to and from the service center plus another phone. Side story: I bought a second hand Anycall (Samsung) Galaxy S from Korea for half the price of the HTC One V and it is just awesome. Though released 2 years before the One V, the features and user experience is basically the same, if not better. The Galaxy S has a front camera for video calls, something the One V lacks. It runs 3d games nicely much like the One V and everything else can be customized. This is a great phone for those who want good android phone without a big budget. Best of all, it doesn't die! Sometimes I forget that I still have another phone pending in the service center. It's only when the credit card bill arrives that reminds me I still have to pay for a piece of sh*t.
I've called the HTC Service center once or twice a week since then just to get the usual "next week" response from their service representatives. It was really frustrating to the point that when they offered to make a follow up report I just told them no thanks and hung up. Like any follow up report from their end would actually help. 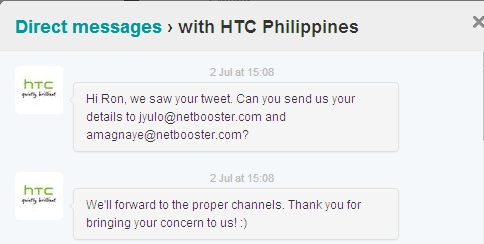 I took to twitter to vent out my frustrations and @htcphilippines replied with a "We sent you a DM :)" tweet. I knew the smiley was for show. And why the DM? Can't @htcphilippines handle their product failures in public? Go on, search "htcphilippines" on twitter and know that I'm not the only one with a dying phone. 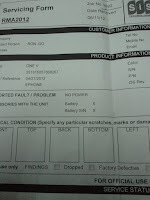 Yesterday I called the service center again to check the status of my phone. I talked to a certain Andrew and I expected the usual "still waiting for parts due for arrival next week" but this time there was no "next week." WTF is that?! After 3 weeks of telling me "next week" now they can't even tell me when? Can someone shed some light on how really far Taiwan is from the Philippines? Last I checked it's just hours away. Unless the cellphone "parts" are made in a different planet, I might react differently. And apparently, it can take weeks or even months for them to get details. action: Fix my phone or better yet just give me my money back. You should send this link to HTC or tweet it to them too so that they know you are making people aware of their inefficiency. So much hassle! Let them know this post and they need to action it properly with no delay. They need to value their costumers and not to let us waiting.